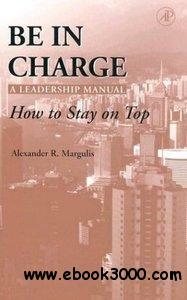 Alexander R. Margulis - Be in Charge A Leadership Manual How to Stay on Top | Free eBooks Download - EBOOKEE! Be in Charge: A Leadership Manual defines what "leadership" is. It includes comprehensive coverage on various types of chiefs (including both business and academic) and discusses gender differences in leadership styles. Also included are terrific tips on how to dress as a leader, budget time efficiently, gain loyalty and respect, terminate employees professionally, recruit qualified people, treat adversity in the workplace, survive and enjoy retirement, and much more. * Gives practical tips on how to dress as a leader, budget time efficiently, gain loyalty and respect, terminate employees professionally, recruit qualified people, treat adversity in the workplace, survive and enjoy retirement, and much more. No comments for "Alexander R. Margulis - Be in Charge A Leadership Manual How to Stay on Top".